ERLANGER, Ky. — Sgt. Jon Sterling spends his days helping the Erlanger community stay safe. Outside of work, he goes well beyond the call of duty to protect one special member of the community. Sterling said Norm lived in the same apartment in Erlanger for 18 years. He was recently diagnosed with dementia. With his recent diagnosis, Norm’s become more reliant on help from others. 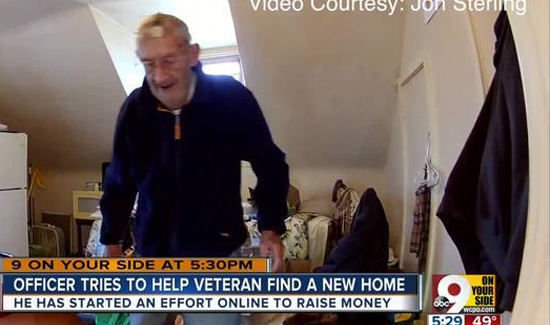 He has no family, but one friend did step up to help. Sgt. Sterling applied for guardianship of Norm, because the veteran has no family. What Sterling’s talking about is an online fundraiser to help move Norm into a senior care facility. Sterling said he would still visit Norm regularly, even if he’s able to move into a senior care facility. One thing the two bond over is books. “He’s got probably a thousand books,” Sterling said. “He loves to read. He’s a very intelligent person. He teaches me every time I come to his house. He’s given me books — he’s given me books to give my (son). He’s just one of those guys who loves to learn. “He was just giving me a lesson in Alexander the Great,” Sterling said. Sterling said he doesn’t think he’s going above and beyond his duty as a police officer.